Hurricane Harvey has hit Punk Rock and UFOs in our own backyard. The resiliency of the people of Houston is inspiring, as through assisting with donations and drives, this author is beyond proud of the city, and how the nation has rallied. Athletes, celebrities, bands like Coldplay, blink-182 and Fall Out Boy have all chipped in in assisting the efforts to help rebuild the city. 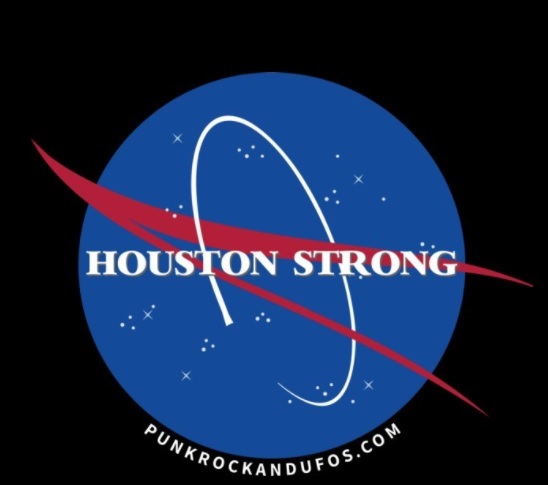 Punk rock and UFOs will now offer shirts, accessories, hoodies, tanks, phone cases, and a wide variety of merch to assist with the Hurricane Harvey Relief with 100 percent of our profits going to the relief fund. So, if you like the design you can get in various colors and products. Taking the traditional NASA logo and putting a spin on it with the "Houston Strong" motto ties to the city, which also hosts NASA in the Clear Lake area. Order here or follow the merch link in the navigation bar.